We can’t imagine our lives without our smartphone, laptop, headphones, iPad. The list is endless. Everything has fundamentally changed in the last 15 years. The way we work, we interact, we train, we learn, we shop, we move, even the way we meet people has been disrupted by the large adoption of digital technology and, of course, the internet. Retail is just one of the many industries disrupted by digitalisation. Statistics show us that almost 71% of customers go online during the buying process, meaning that only a small 29% of shoppers now walk into a store and buy something without online preparation. A major shift in customer behaviour in the last few years. Moreover, the online experience drives the customers’ behaviour in both directions. Webrooming, when customers research online and then purchase in a physical store, or maybe the opposite, showrooming, when people browse an item in-store and then buy it online. But what should we expect in the future? A higher number of online buyers: Online shopping is now mainstream not only in the developed world but it is spreading to the emerging markets like Africa. A higher number of online purchases via mobile: Forecasts predict that more and more people will buy online via mobile and that customers will expect payment to be fast and smooth, which means more payment options and stripping away any barriers to pay. Streamlined websites for speed: We’re all busy, and typically a user leaves a webpage if it takes more than two seconds to download. So, not only customers do expect the same level of ease in all transactions, there’s a proportionate demand for fast websites requiring retailers to streamline their content for speed. More options for paying and more channels where to buy: In 2019, shoppers will want to access products online, via mobile, through marketplaces, and in person, if possible. Sephora, the beauty multimillionaire business is a great example of how multichannel – online, in-store and mobile – offers an array of choice for consumers on how, where and when they want to buy their products. More Tech savvy and prepared customers: Digital natives will increase in numbers, sporting some serious technology in their phone, and looking for new and shiny things to try and buy. 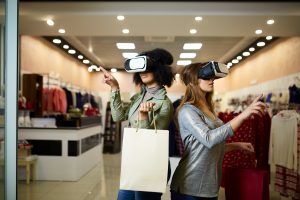 These are only some of the reasons why Retailers and other businesses are looking for new ways to market their goods, in order to provide experiences which are unique and able to engage customers. How can Interactive Virtual Reality help? In the past few years, Virtual Reality is being increasingly used both for content marketing or to enhance the customers’ experience. We refer to ‘’Interactive Virtual Reality’’ when you are viewing a virtual reality experience that contains hotspots, digital elements you can interact with to see additional content, including videos, photographs or text elements. We first saw this with VR tours of properties in real estate, but it was complex and expensive, and on top of that, difficult to view. A problem partially fixed by the introduction of more affordable 360degree cameras. Today you can just film in 360, upload to 360degrees and gamify. Your audience will have the opportunity to experience the builder’s new display home – as if they were there. Imagine walking into the kitchen and as you look at the stove – the specs from Miele appear as if by magic. When you check out the bench, a video window appears overlayed over the benchtop explaining why Caesar stone is such a great material and included in the price of the house. The use of hotspots, in this case, encourage the user to explore another room or space. Another example of how to use Interactive Virtual Reality videos are Events and live experiences. Want to buy online a ticket for a football match? Before you purchase your ticket from the website, you can actually select your seat and see the best spot as you were seated there already. Then a hotspot shows up and you can select an option for food and drinks by clicking the overlayed window at the corner of the screen. Wedding planner agencies are experimenting new ways to engage customers making available detailed tours of the venue in 360dgrees, with some hotspots you can click on to call up additional information, such as menus, short videos or even footage of previous weddings held in that same space. As mentioned before, customers tend to spend more time researching online before purchasing and this is particularly true when it is a sophisticated product, such as a smartphone, a laptop or a car. The use of 360 degrees video can literally boost the car industry market allowing the customer to experience a virtual driving tour and to evaluate vehicle options and features before physically visiting the showroom for the final phase of the purchase cycle. Some travel companies have started using VR technology to give a virtual tour of the flight, or hotel room in advance, in order to increase ticket or complimentary services sales, using the support of hotspots to make the experience interactive. Like Hawaii? Do a tour with a 360 headset and click on hotspots to explore accommodation, availability or suggested activities. Thanks to the increased adoption of 360 videos and the introduction affordable 360 headsets, we are confident Interactive Virtual Reality will continue to offer a more attractive experience to engage customers, providing them with detailed visual information to create a unique experience. 360Dgrees.com is an Interactive Reality platform for uploading, managing, customising, and publishing 360 Immersive experiences. 360Dgrees.com empowers anyone to do great things with Interactive 360 Videos with a range of customisable features such as playlists, picture-in-picture video, and hotspots. Want to create new experiences and engage your customers using 360 videos? Discover more 360dgrees.com or contact info@360dgrees.com for more information.